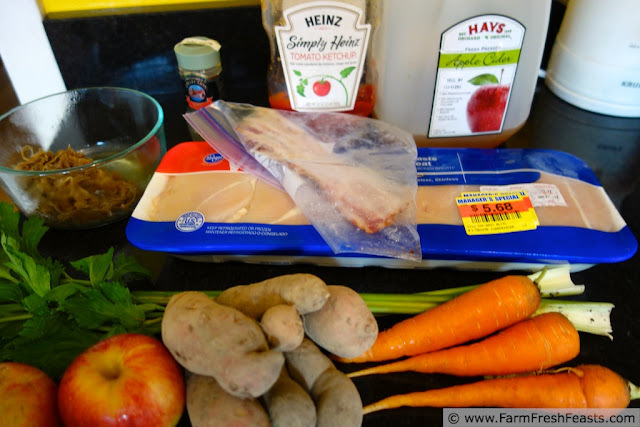 Farm Fresh Feasts: Chicken Cider Stew (from Kitchen Parade): My Personal Fall In A Bowl! 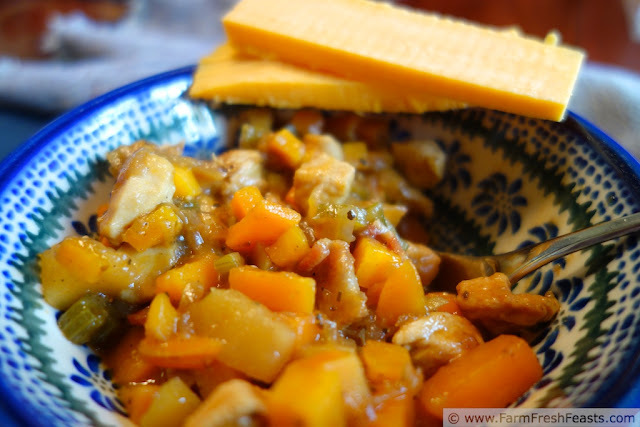 Chicken Cider Stew (from Kitchen Parade): My Personal Fall In A Bowl! Kristy of Gastronomical Sovereignty is on vacation in Merrye Olde Englande, so I'm sharing with her readers how I get two 'storage amounts' of my favorite cook's crops--garlic and basil--out of one garden plot over the course of a year. 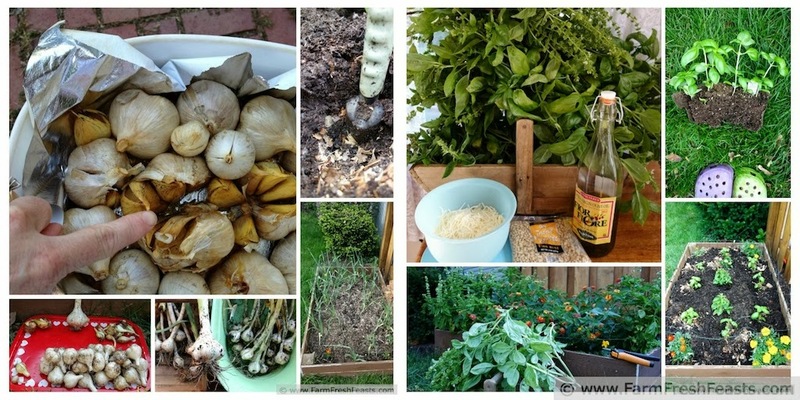 The time to start this endeavor is now, and if you like to cook with garlic and pesto, you need to check it out! You can read all about it here. I'm doing this whole "I've got a guest post up, go see" thing completely wrong. 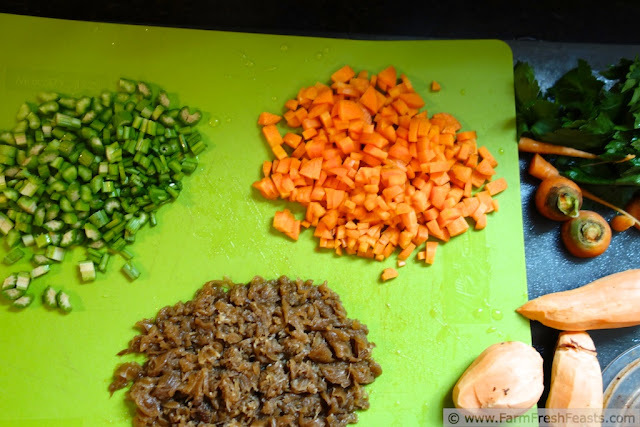 Instead of just directing you to Kristy's blog today and calling it good, in fact I'm sharing the second installment (but first post) of my Food Bloggers Change My Life series. Confusing? Yes, sorry--I shared Rebecca at Foodie With Family's Slow Cooker Chicken Tikka Masala previously, but I started the series because of Alanna of Kitchen Parade and A Veggie Venture. She is my friend and Food Blogging Mentor (and I'm so grateful last year that she didn't laugh at my email of 'I'm thinking of starting a food blog'). We like this served with a hunk of sharp cheddar cheese. Every time I read a food blog, I get inspired to try all sorts of new flavor combinations, and sometimes I actually follow through with my ideas. Rarely, though, does a recipe--exactly as written--become part of my regular menu rotation. I'll digress at this point and say by 'menu rotation' that would imply that I actually have a menu plan. Ha! During the CSA farm share season (mid-May to Thanksgiving-ish for me) I never know what I'm going to get in the farm share crate. And other than the cow in the freezer I never know what protein I'll have on hand. So I just kind of wing it on a daily/weekly basis. However, there are some meals that, when the right elements collide, I already know what I'm making for supper. This recipe is one of those. I read it when Alanna put it up on Kitchen Parade in 2007, had almost all the ingredients--still don't have savory--and made it. Loved it. 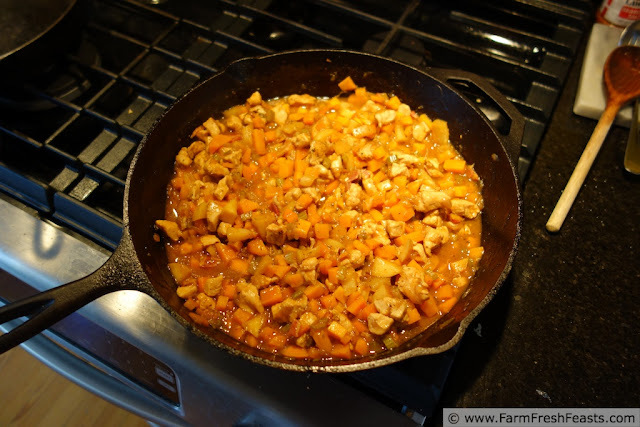 The following Fall when it cooled off and my thoughts turned to stew, my farm share box had sweet potatoes, apple cider appeared in the farmer's market and the stores, I craved it again. The next year, again. And so it goes. 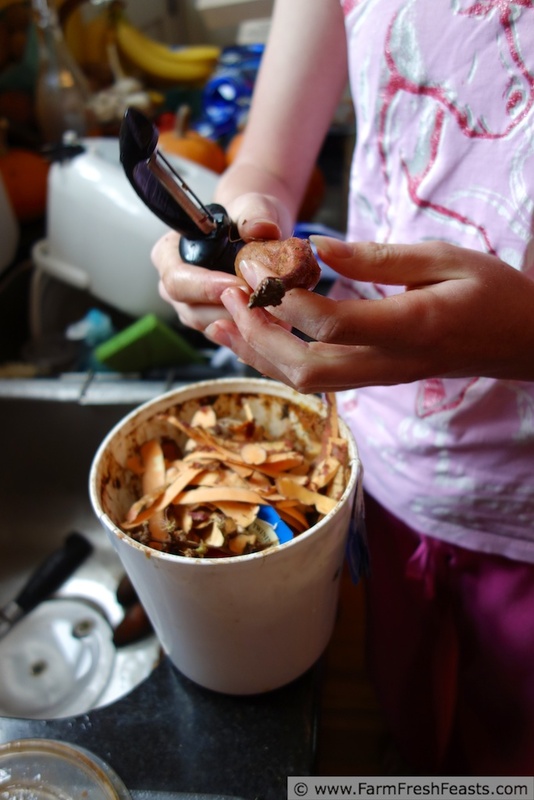 Reading that recipe six years ago made a permanent change in my Fall menu rotation. See, food bloggers are making a difference! I'm not going to provide the recipe here. I've linked to it here. If you found me (thanks! ), you can find Alanna! You'll need chicken, carrots, celery, apples, bacon, onions, ketchup, apple cider, and herbs. Have a minion peel the sweet potatoes. 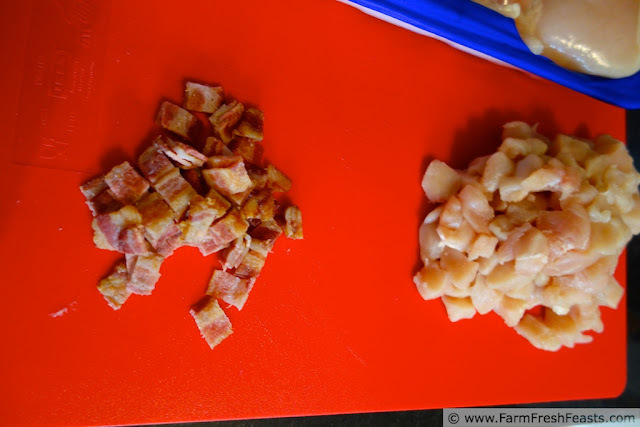 Chop the bacon and set aside. 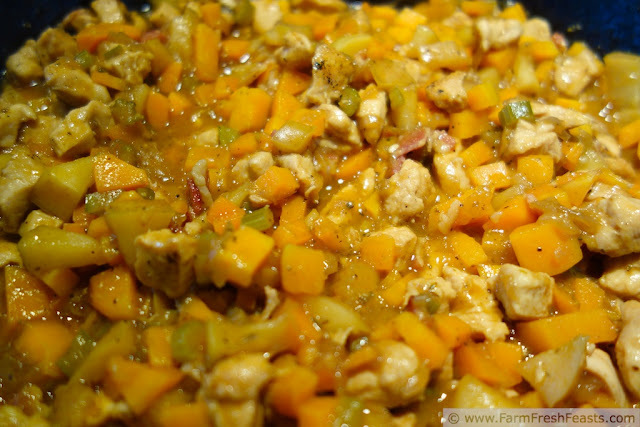 Brown the chicken chunks in a large skillet. Set aside. Finely dice the carrots, celery, and onions--caramelized were delicious in this--don't forget the soup pack or composting pigs for the carrot tops and tips, and the celery leaves! 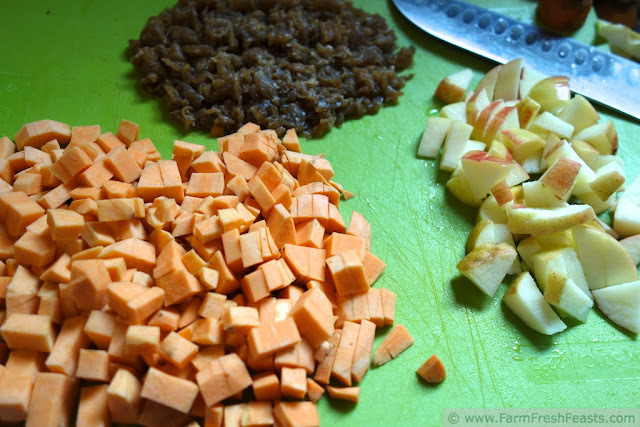 While the carrots and celery are sautéing, chop the apple and sweet potato. 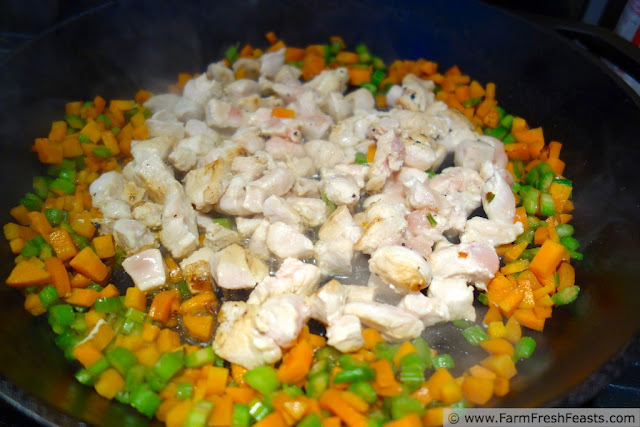 Add the chicken back to the skillet, stir to combine. 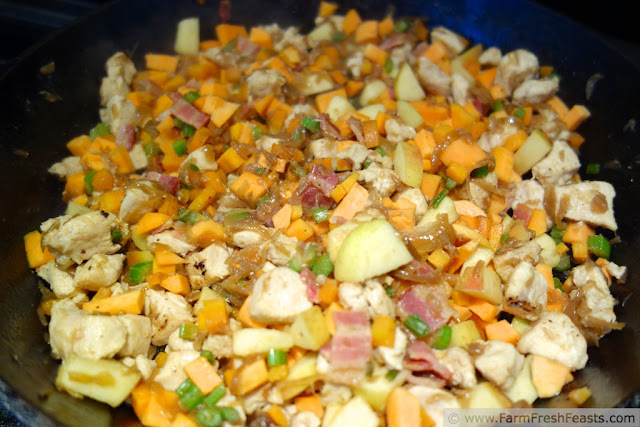 Add in the sweet potatoes, apples, caramelized onions. Don't add in the bacon yet. I was in a cleaning frenzy and tossed the whole cutting board worth into the skillet. My bad. It goes in at the end. Add cider, ketchup, and seasonings. Simmer. At this point you'd add in the bacon and call it done. Fall in a skillet! Thanks--you can see why I crave it year after year. It's really a brilliant combo. I'm keeping a mushroom-laden soup pack for a vegetable stock, once I have room in the freezer and a soup in mind. I hope the starter is at least in the fridge? At all the best parties folks congregate in the kitchen anyway, so this is a fun kitchen to hang out it--I've met so many nice folks! Alanna's recipe, just my how-to, but I'm awfully glad to pass my cravings along to others. Dang this looks yummy! I'll have to give it a try. For some reason my family always hesitates at stews and soups. I think this might be a good one to convince them! 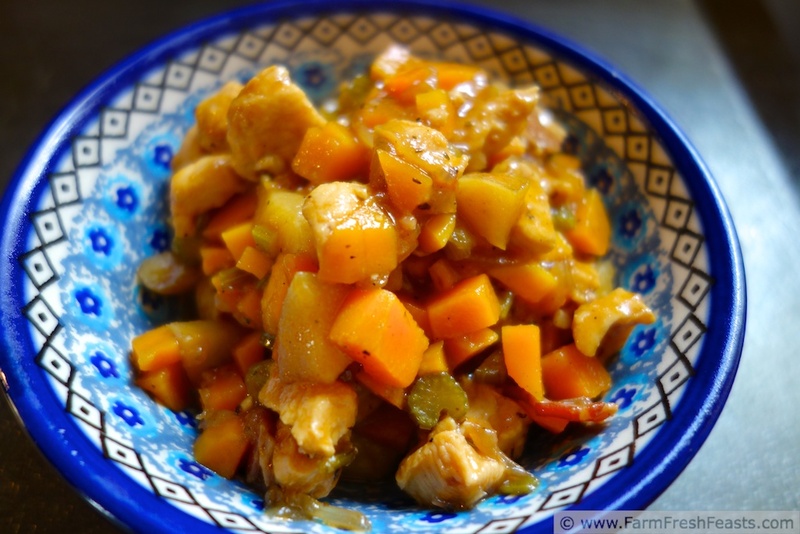 This is a delicious stew--I introduced my kids to dumplings on top of stew a few weeks ago, and I think they will request them every time. A big hit! Another delicious dish for the season. Thanks for sharing and linking up! I much appreciate you hosting!